My little one recently visited a local pumpkin patch with her school and brought home a little pumpkin which is so cute like her! Look at the pumpkin! Isn’t it cute? She placed the pumpkin in my hands and asked, “Mommy! Can you make me a pumpkin pie?” I told her OK and forgot about it. But she didn’t! Finally I decided to make the pie today and started searching for pumpkin pie recipes on the internet. Most of the pumpkin pie recipes involved lot of work. I am little lazy to do that much work to cook something. So I wanted to make something easier, but definitely a pie! With some imagination, I came out with this recipe that looked good and tasted great! 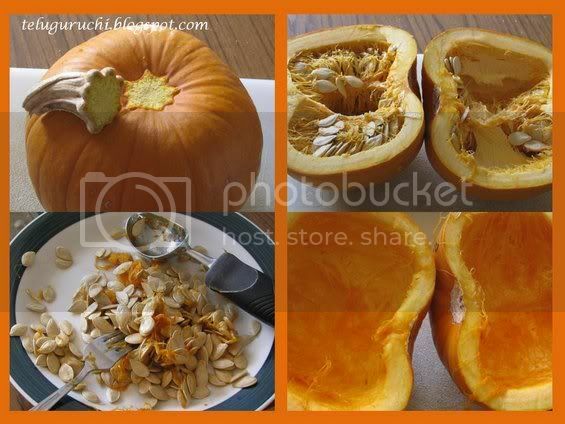 Wash the exterior of the pumpkin, remove the stalk and cut it into half like in the picture. Remove the seeds and the stringy stuff inside by scraping with an ice cream scoop. I saved the seeds to make spicy pumpkin seeds powder, that goes well with rice. 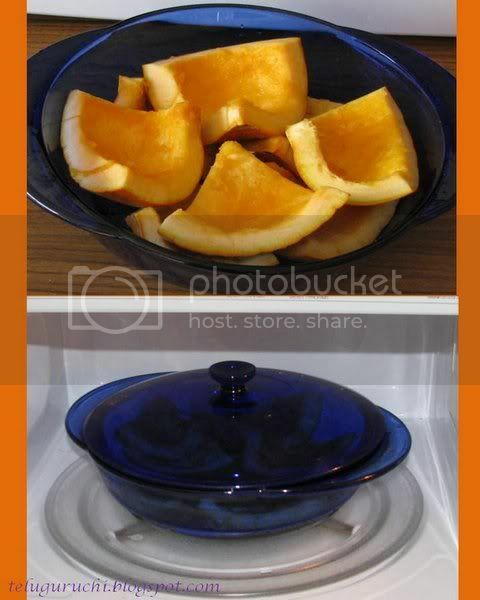 Pour a cup of water in a microwave safe bowl and place the pumpkin pieces in it. If the pieces are too big to fit in the bowl, cut them into little pieces. Then cover the bowl and microwave on high power for 15 minutes. Check if the pumpkin is soft and easy to be scooped out. If not, increase the time as needed. Leave the bowl for some time till the pumpkin pieces are cool enough to touch. Then scoop out the flesh, mash well with a fork until it becomes soft and fluffy. Add little water if needed. Then add the vanilla extract and mix well. Keep aside. Later prepare the gelatin agar agar mixture. Mix gelatin agar agar and sugar in a small bowl. Add boiling water to it and stir it untilgelatin agar agar completely dissolves. Add the gelatin agar agar mixture to the pumpkin mixture and mix well with a spoon. Pour this into the prepared crust. Refrigerate until the pie sets and becomes firm, approximately about 3 hours. Garnish with whipping cream and enjoy. My Notes: As I used only ½ cup of sugar in this recipe, the pie didn’t taste so sweet. I think we better add 1 cup of sugar to make it sweeter. This is my contribution for Madhuram’s “AFAM: Pumpkin” event. “A Fruit A Month (AFAM)” was the brainchild of Maheswari. 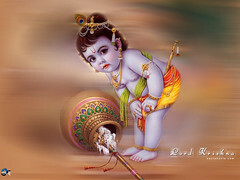 I am also sending the Pumpkin Seeds Powder, which I posted long back to the above event. Thanks Priya and Rekha for passing the “chocoholic award” to me. So sweet of you! Who can resist chocolates! I haven’t made any recipes with chocolates though! I always buy those from the store. White chocolate is my most favorite kind of chocolate. And I also would like to thanks Daily Meals for passing me the “Butterfly Award”. Thanks for your nice gesture DM! I too have a big batch of Pumpkin..from my daughter..Pie looks delicious Uma..Nice pics too!!! Lovely pie with less sweet Uma! I've never made a pumpkin pie using a whole pumpkin... 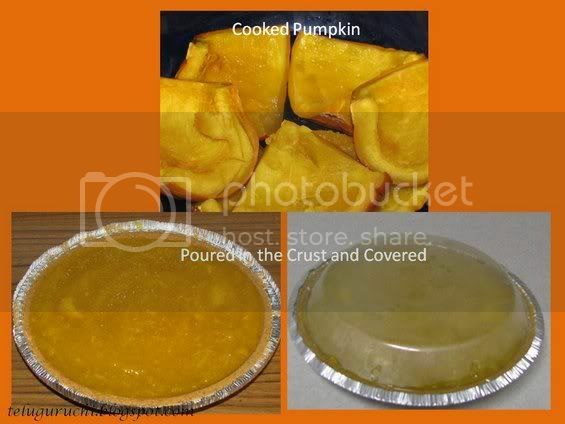 I've also never had a pumpkin pie made with gelatin... It sounds really good! Congratulations on your award! 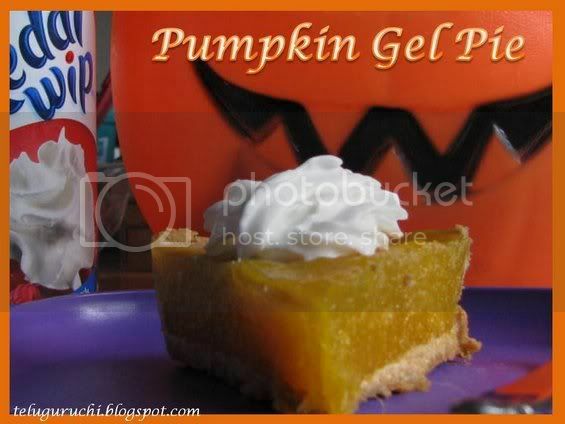 Wow Pumpkin gel pie looks fabulous Uma...Congrats on ur awards.. Happy Deepavali, Uma! The pie looks good. Very nice! Pumpkin pie looks great. & thanks for that chocolate. I just love dark chocolate!! 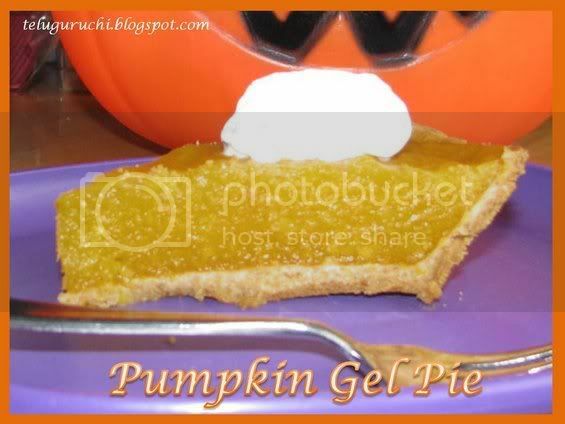 Oh my god the pumpkin looks so cute.Love the gel Uma, I have bookmarked it and try out soon.Thanks for sharing such a nice recipe and hugs and kisses to ur cute pie. chaala baavundi pumpkin pie. chustunte shop lo konna daanilaa vundi. Very nice recipe and thank you so much for passing on the award to me dear Uma. So cool,using microwave oven!Looks cool too! 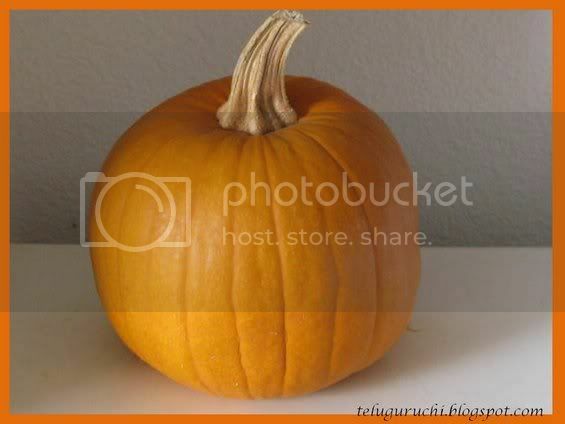 Cute pumpkin. Pie looks lovely. Congrats on the award. Your pie looks awesome Usha. Uma, your step by step illustration is too good :-) Congrats on your awards and i just checked the pumpkin seeds powder recipe too. gr8 idea! 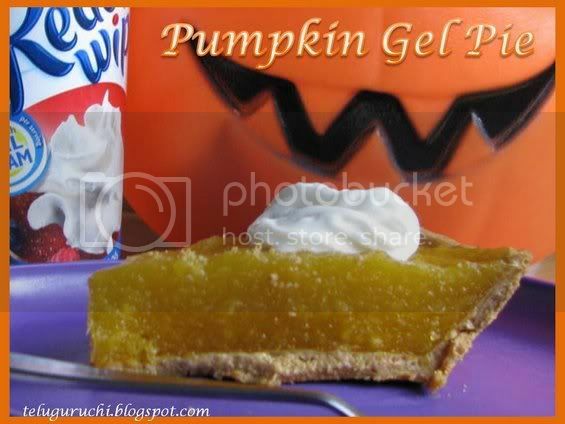 Happy Halloween and the pumpkin gel pie looks smashing. Thanks for sharing the prep work with pictures. The pie looks delicious...Congrats on your award Uma! so delish and diffrnt recepi uma. congrats for the award. Yes I'm chocoholic, sweetaholic, dessertoholic. Thanks. Looks delectable, Uma! Never saw a pie with gelatine before - it looks perfect!